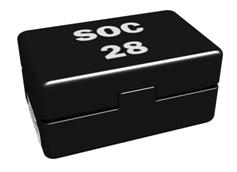 SOC Corporation : SOC fuse technology for reliable comfort and safety in a rapidly changing world. MCF3 is a new generation surface-mount and hermetically sealed fuse made possible thanks to SOC's unique miniaturization technology that builds upon the in-air design of SOC's cartridge fuses in which the fuse element is stretched and suspended inside the fuse body. This application note introduces MCF3's exceptional performance, construction, and primary applications. A compact surface mount fuse with minimal variation of pre-arching characteristics thanks to its construction in which the wire element is suspended in the air. Operation at low currents is made possible by dramatically reducing resistance through the application of wire element. Lowest rated current is as low as 28 mA. Terminals are secured in the case by insert molding, and element is spot-welded to terminals. Hence, this product is made solder-free and Pb-free. Case and cover are adjoined with halogen free and high heat resistance adhesives. With the above, the fuse’s construction is made compact, hermetically sealed, and surface mountable so that it can be used in a wide range of applications. Compact surface mount fuse with airtight construction for explosion-proof areas, compatible with low current ratings, and optimal for portable explosion-proof devices. It is optimal as a surface mount fuse for overcurrent protection of control circuit outputs of sequencers and other FA devices, or for overcurrent production of POL power supply (DC-DC converter) installed in close proximity to the load circuit. This surface mount fuse is optimal for a wide range of applications, such as the following. © 2019 SOC Corporation. All Rights Reserved.